MOSCOW, April 5. /TASS/. Russian survivalist and voyageur Fyodor Konyukhov who is currently circumnavigating the world solo didn’t manage to cross the Southern Ocean to reach Cape Horn in 120 days, according to his earlier plan. One thousand nautical miles (1,852 km) remain to be covered to reach this point, according to the journey notes provided to TASS by his son and expedition organizer Oscar Konyukhov. "Four months ago I left New Zealand, and Cape Horn is still 1,000 miles away. It doesn’t seem very far, but on the other hand it’s the distance between Moscow and Chelyabinsk," Konyukhov’s notes read. Initially, his scheduled pace was an average of 50 miles per day, with 6,000 miles between New Zealand and Cape Horn. Currently, he has covered around 5,200 miles (9,530 km). The Russian voyageur points out that he hoped "for long periods of west winds and the circumpolar current, as well as long stern waves," however, these hopes that he had for the Southern Ocean had vanished. "That’s how I remember and know this ocean. I’ve been crossing it since the 1990s. And the main thing is that I’ve seen and experienced it all, when I was travelling on yachts. The west wind could blow for two weeks straight, I could leave tack unchanged for half a month straight. This year everything’s different," Konyukhov wrote in his notes. In early April, a storm in the Southern Ocean tipped the globetrotter’s customized rowing vessel over and damaged it for the first time in this round-the-globe voyage. The waves tore off the solar batteries on the port side, as well as the windsock. To assess and repair damages the explorer needs to dock, however, until he reaches Cape Horn he will not have such an opportunity. The rest of the trip to Cape Horn will be extremely difficult. As Fyodor Konyukhov writes, "I need to make every effort to continue south to safely reach Cape Horn." "I plan to cover 200 miles east and I degree south (60 miles). This way I’ll be able to reach the Drake Passage. If I fail, there’s a risk that the ocean will wash me ashore to the Western Chilean coast. It even looks scary on the map, it’s all sliced up by storms and winds," he pointed out. 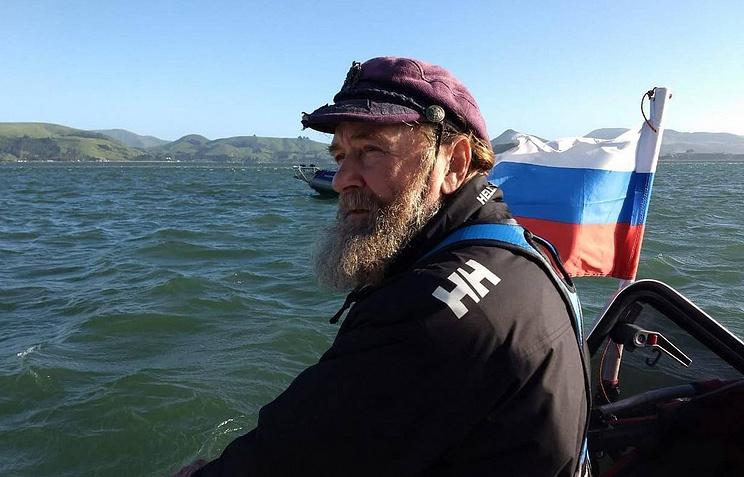 Fyodor Konyukhov began his solo circumnavigation around the world on a rowing boat on December 6, 2018, setting off from the port of Dunedin in New Zealand. The expedition is divided up into three parts: Dunedin (New Zealand) - Cape Hown (Chile), Cape Horn - Cape Leeuwin (Australia) and Cape Leeuwin - Dunedin. In total, Konyukhov will have to row 16,000 nautical miles (27,000 km). The rowing boat dubbed Akros, which the voyageur is sailing to circumnavigate the Southern Hemisphere, was designed specifically for the expedition by British engineer Philip Morrison. The nine-meter long boat has water-proof compartments for food storage and three independent systems of producing energy: solar modules, wind generators and a chemical power supply station that uses methanol to produce energy. The boat is also equipped with two types of satellite phones, a satellite tracker and a few duplicate systems of connection and navigation. So far, Fyodor Konyukhov has sailed around the world five time, crossed the Atlantic Ocean 17 times and became the first Russian to complete the Explorers Grand Slam: he climbed the highest mountains on all seven continents and visited the North Pole and the South Pole. In 2007, Konyukhov circumnavigated the Southern Hemisphere aboard a sailing yacht dubbed the Scarlet Sails when he crossed the Atlantic, Indian and Pacific Oceans.